Many women keep pregnancy loss to themselves. But it shouldn’t be a taboo subject as it can happen to anyone. Today, Carly Hussey shares her story of an ectopic pregnancy. Her story just might save your life. On Thursday, October 29, I woke up and smelled Lay’s Potato Chips. I had successfully weaned myself off them after months of being obsessed. They were my biggest pregnancy craving during my first pregnancy. I knew that I was smelling those chips for one reason and one reason only. That afternoon, I saw something I’d only seen once before: a positive pregnancy test. We celebrated. We cried. We hugged our 13-month-old. We wanted two in a row semi-close together so they could have the same sibling relationship that we both had growing up. This was what we wanted. So when I started feeling them, I was terrified. The cramps, the pains — they weren’t normal … at least from what I knew to be normal from the first time. My first pregnancy wasn’t textbook (in a good way): barely any nausea, no puking, I was able to work out the entire time and stay fit, I only gained 30 pounds, I had few cravings and was able to eat healthy, I posted pictures of my bare belly with pride, and I wore a bikini the entire summer with excitement of my growing bump. I gave birth to a beautiful, healthy baby girl in September. This wasn’t that. It didn’t feel the same. It was easy to tell myself that maybe it felt different this time because we were having a boy. It was easy to tell myself that for a day. The next morning, I woke up with shooting pains in my abdomen. “Take a shower,” I told myself, “You always feel better after a shower.” So that’s what I did. Of course, that’s when I got dizzy. I fell to the floor of the shower and started getting sick. There I was, crying on the shower floor, banging on the shower door to get my husband’s attention, and I wondered how I got there. What did I do wrong? Everything was perfect the first time, and I knew nothing was perfect this time. We determined over the phone with my OB/GYN that I was 6 weeks pregnant, which is normally the point of celebration, but I was still having shooting pains in my gut. They didn’t even want me to come in. “Go straight to the ER. Now,” the nurse said. My heart sank. 1. There’s some blood in your abdomen, but it could dissipate on its own. So, you can go home to see how you feel and come back in a day or two if your condition doesn’t improve. 2. Take a pill to end the pregnancy. Go home. Things should improve on their own. 3. Explorative surgery to see exactly what’s going on, but we don’t like to jump to surgery in a young, healthy female. We asked them to call my doctor so we could get a second opinion since he was refusing to give us a recommendation between the three options. How could we possibly be left responsible to decide something like this with zero medical expertise? I couldn’t breathe then, and I can’t even breathe as I sit here writing this. My husband started googling “ectopic pregnancy” to try to get us more information. I called my mom, sobbing, giving her all the details. I was still on the phone with my mom when my personal doctor came busting into the exam room. It’s pretty much all I heard, and then the room started spinning. I remember telling the nurses I was going to be sick. And then the next 20 minutes consisted of inserting a second IV for surgery, having my (favorite) sports bra cut off with scissors, taking my contacts out (so now I can’t even see anything clearly), and getting wheeled upstairs for surgery prep. I was cracking jokes the whole time, how I should have painted my toenails that morning, how I should have shaved my legs, finished my shower even. Anything to stop thinking about what was happening. My husband was so strong. I knew he was hurting. I could see it. But he was being so strong for me, and I was just trying to be strong for him. I said, “See you soon” to my husband and a silent “goodbye” to our 6-week-old pregnancy. Then I woke up in recovery, and — just like that — it was all over. One of my fallopian tubes had ruptured, but they had successfully repaired it. I was no longer pregnant. No physical activity for two weeks. No lifting anything over 15 pounds for two weeks. I consider my husband and me to be incredibly lucky. My parents flew down from Illinois to Florida the following day to help with everything for the first week. They cooked, they changed diapers (not mine, obviously, haha), they cleaned, they did all the heavy lifting. My husband’s mother took the second week off work to do the same. Everyone dropped everything to help us get through those two weeks. Then there we were on the third week, back to reality, and back to dealing with life on our own. That was when the real recovery process started for me. My husband took some time off work and we were left alone with our feelings. I know this sounds crazy, but my first instinct was to start working out again. I needed something to work out my problems, something to throw my negative energy at. So when I got upset, I worked out. I had gained 5 pounds, not that I cared, but I could feel it. I felt tired and groggy all the time … which is understandable after two weeks of bed rest from an abdominal surgery. If I was going to recover mentally, I needed to feel better physically. So I turned my focus toward my nutrition and my physical activity. I chose a home workout program that was low-impact and FUN to slowly bring my body back and to keep myself interested. I started my mornings with a protein shake or eggs and a vegetable. I had amazing salads for lunch. My husband cooked delicious dinners. And, of course, we had nights where we ordered pizza and vegged out. We took time to do nothing but enjoy our toddler and just heal. I was so exhausted from starting workouts again, but a good kind of exhausted. I couldn’t believe how out of shape I felt, and it would have been easy to just stop and accept defeat. I felt defeated, so why not just go with it? But if you’re going through this, please don’t accept defeat. Please keep moving. Find something that makes you feel better and makes you feel like yourself again. For me, it was working out and eating a lot of good, clean food. It took a LOT of effort, but I felt amazing at the end of the day (even with a greasy NY pizza for dinner, because I had rocked out the morning and afternoon). To heal mentally, I had to do what felt right to me. This was never a valid pregnancy, but it felt real to us. And no one could tell us any differently. We had lost a child that day, and that’s how I’ll always feel about it. We purchased a rose and a candle. I still, to this day, light the candle every time I get into the shower. It’s called Calming Seas, and it crackles like a wood fire. Who knew candles could be so calming? I also found a company on Instagram that raises awareness and funds for couples struggling with fertility. I didn’t feel like I 100 percent qualified since we have a healthy baby already, but their posts and cause helped me in my time of need (@scarletandgoldshop). It just so happened that when I found them they were giving out free Give Grace tattoos in exchange for being open and vulnerable about infertility struggles. I wore mine right next to my scar from surgery on my abdomen. The goal is to find freedom in being real and help carry each other’s burdens. I felt like telling my whole story in writing would really free me, and that’s how I found myself here … telling you my (long) story — thanks for sticking it out to the end! I was given a second tattoo to give to someone that is struggling with similar problems. Since these topics aren’t typically shared in public, I don’t know many people who would want to wear and share this tattoo with the world. If you are one of those people, please reach out to me on my #GiveGrace post on IG (@stairwaytohealthy) so that I can choose someone who will share this message with their friends and family. 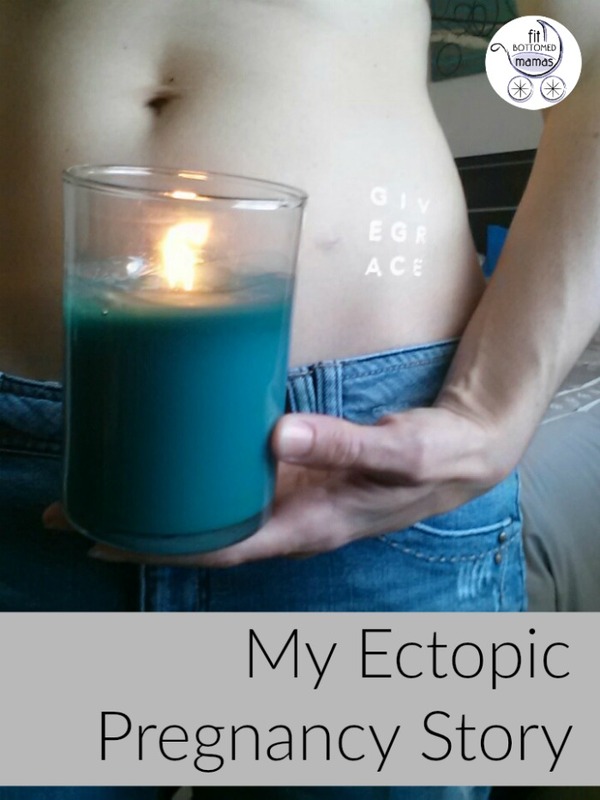 Sharing our stories of ectopic pregnancies could literally save someone’s life. If I had stayed home, or left the hospital when given the chance, I could have lost my life that day in addition to the life already lost. I also feel drawn to share my second tattoo with someone from the fit community because we are often seen (and see ourselves) as strong women who don’t need the additional support of others. But let me tell you, without the help from others I wouldn’t have “healed” so quickly — both physically and mentally. Plus, I love my fit bottomed ladies! My hopes are that any man or woman planning to have a child of their own one day will learn the signs of ectopic pregnancy and will be able to make an educated decision to go to the hospital and get checked out. Gone unnoticed, you could lose two lives instead of one. So if you are experiencing stabbing pains in your abdomen early on in your pregnancy, please call your doctor ASAP and ask about ectopic pregnancy. If you stay smart, you will stay safe. Thank you for listening to my story; and I would love to connect with anyone looking for motivation and inspiration to stay healthy and fit through all the personal struggles that come our way — because keeping a healthy body and mind takes a whole bunch of support. Don’t try to do it alone. *An ectopic pregnancy is when the fetus develops outside the uterus, typically in a Fallopian tube. I am bursting in tears reading your story.. Today I had to have surgery because I to was having an etopic pregnancy. I am soo hurt because this was my very first pregnancy 😭..